One of the more productive uses of the iPad -- there aren't that many, after all -- is the ability to unobtrusively take notes. The device's small footprint makes it the ideal companion for carting around Viget to meetings, or quickly recording an idea, particularly for project managers like myself. 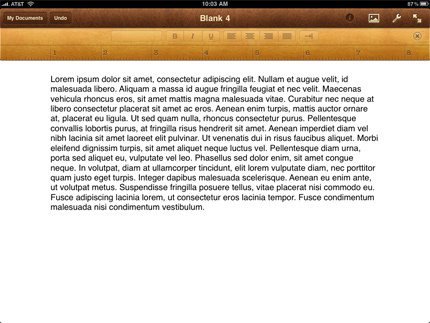 And surprisingly, the onscreen keyboard is responsive enough to closely mimic typing on a physical one. The iPad is a clear win, but the programs available for it with which to document your musings are a more complicated equation. After seven apps and four weeks of iPad ownership, I can't say that any of the options described below are perfect. Some are better than others, and it depends on your note-taking style (e.g., words versus pictures). These apps represent a small portion of those available in iTunes store, and I arranged them according to the ones I found least and most useful. 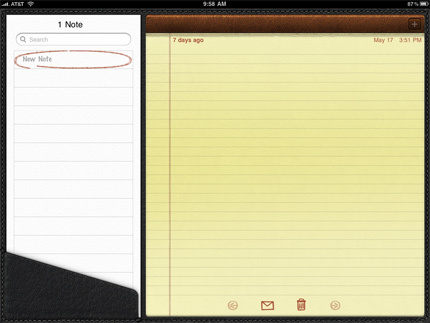 Apple's built-in Notes application is as bare-bones as its iPhone counterpart. 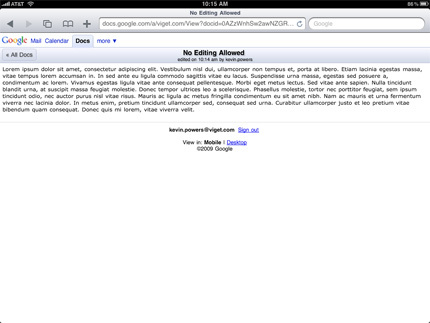 Nothing exciting or compelling here outside of the redesigned interface for the iPad. Simplenote is a straight-foward little app that doesn't do much, but what it does, it does exceptionally well; that is, the cross-device app (iPhone, iPad, iPod Touch, Desktop, Web) supports basic note taking and almost immediate syncing to the cloud. The app is most useful for bite-size pieces of information that you often need at the ready, such as conference call details or a client's phone number. It's not so useful for lengthy documents. One of the most popular utilities in its class, Evernote is great for collecting a spectrum of notes -- photos, screenshots, audio, text. The app loses some of its utility in the iPad version (e.g., no photos), and only allows for limited note taking by way of an email-like experience. 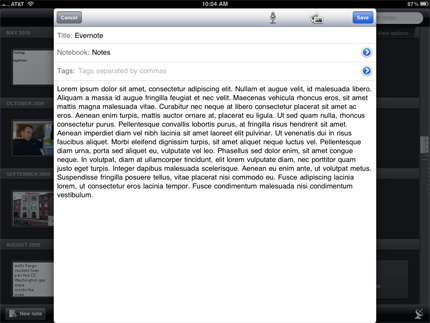 It's passable, but probably most useful for those that use Evernote elsewhere. SoundPaper takes a cue from the tech-dense Livescribe pen and records audio while you type, even syncing the two for easy reference later. 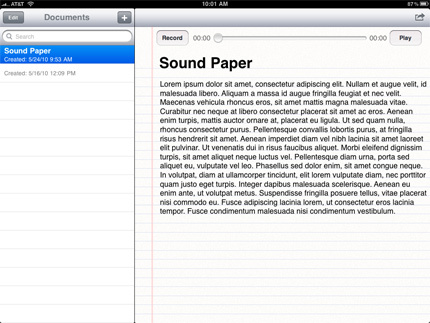 The app is intriguing and follows a recent trend of pairing audio and typed notes, but I found SoundPaper less useful than one would hope. To use the app most effectively, you have to be mindful of what you're typing and what's being recorded. Sidebar notes and lazy note taking can throttle the apps intended utility. I also found the most evident sound recorded was the tapping of my fingers. The only sketch-focused app here, Penultimate is a lot of fun if your notes don't require typing. 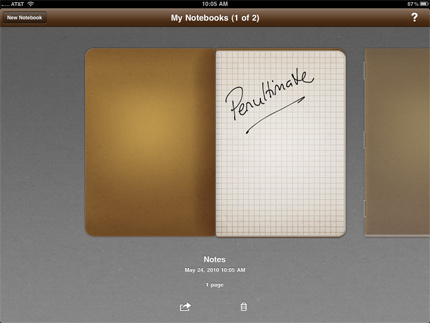 The interface depicts various plain manila notebooks, which you can open up and draw to your heart's content. More form over function, to be sure, Penultimate is even better if you grab a Pogo Sketch stylus. 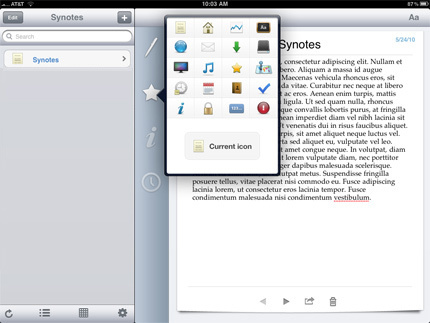 Synotes has a slick interface and the app's attention to detail makes it one of the most useful here. You can change your font, assign a well-appointed icon to your particular doc and view previous versions your file, just to name a few of the robust features available in the app. Documents are instantaneously saved and synced online, making it an "always available" app like Simplenote. While it's pretty boring to appoint the most expensive app from the big corporation the best in the lot, Pages is quite an accomplishment by Apple. The app supports full-fledged document production to include extensive font and layout styling, along with a range of embeddable elements (e.g., images, tables, charts). Some users may find this to be overkill, but the more I used the app, the more features I found worthwhile for everyday note taking. A Bluetooth keyboard increases the utility of the app (and iPad) significantly, despite looking like a laptop that's been broken in two. That didn't stop me, however, from using this approach to create this blog post.